These are a few questions that have been asked, with answers. Please contact us if you have questions not addressed here. If useful to others, we’ll add it to our list. Q. Is there a guide I can use to better learn how to use the knife sharpener? A. 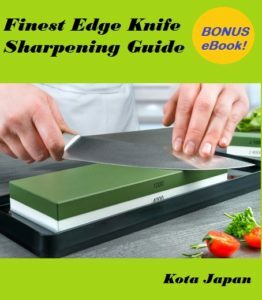 Yes, we’ve created a handy Kota Japan Knife Sharpening eBook that you can view and download in PDF format. A. You have 30 days to return undamaged/unused items for a money back guarantee. If items are damaged or significantly used, we may not issue a refund, or it may be partial. Q. How long after I order will an item ship out? A. Items usually ship within 1 – 2 business days. Q. Is this suitable for ceramic knives? Q. Do I ever need to flatten the stone surface like traditional sharpening stone? A. Yes, must be flat. Q. Can it used for a Japanese katana? A. For sure. I hope you like it. Q. Does it not come with any instructions ? A. Not right now. The next generation will have it on the box. There are a lot of videos on Youtube. Q. Will this work for Damascus? A. Yes, for sure. This is a very good choice for all fine steels. Q. I’ve seen pictures of these awesome products. When will they be available for purchase? A. Now! Enjoy… Very soon! We’re just finishing preparations to add them to our offerings! Q. Does it produce granite dust? A. No. The stone is super hard.